There’s a big void out there when it comes to Buyer Personas. Most companies that we talk to are familiar with the broad concept, but have not taken the time to build creative buyer personas. What is it with Buyer Personas that makes them scary? They are an exercise in imagination, but ideally, backed by research. So even though the sales force believes they know who they are marketing too, they can’t supply all the details that marketing needs to create engaging content. Sales and marketing aren’t ready to define Harry and Sally, represent them with images, and record details about their personal lives and social sharing habits. But here’s why they should. All of these companies want to sell their products and services. If you flip it around for just a moment, let’s imagine that a company wants to “buy” a product or service for a customer. Can they do a good job if they only know a customer’s typical demographics of age, gender, education, company and title? Can you buy someone a skincare product with this targeting approach? Can you buy them a car? Can you buy them groceries? Or sports equipment? Or even a laptop? I think the answer is NO! You don’t know who they are. A job title is a poor indication of their wants, needs, and desires. Start by trying to picture your prospect in a “daily life” situation. Ask yourself how this prospect would likely research and look up information before making a purchase. You can use a real person as a starting point, if it helps. What products or services do they spend time online researching? How do they plan on using those products? Do they like reading about current events? Do they watch videos or listen to podcasts? Role: What is their title? What skills does it require? Who do they report to? Does anyone report to them? Company: What industry are they in? How large is their company? Goals: What are their responsibilities? What goals are they working towards? How are they working towards them? Pain Points: What are their challenges, their main pain points? What is holding them back from accomplishing their goals? Social Affinity: Where do they go to consume information? What specific channels do they frequent? Do they subscribe to a particular Blog? Club? Organization? Personal: Gender? Age? Education? Children? Location? Buying Habits: What is their preferred method of interaction with sellers? What factors influence their purchasing decisions? Armed with fresh information, you can now begin to construct one or several Creative Buyer Personas. Give them a name. Give them a face. Describe them in detail to bring them to life. 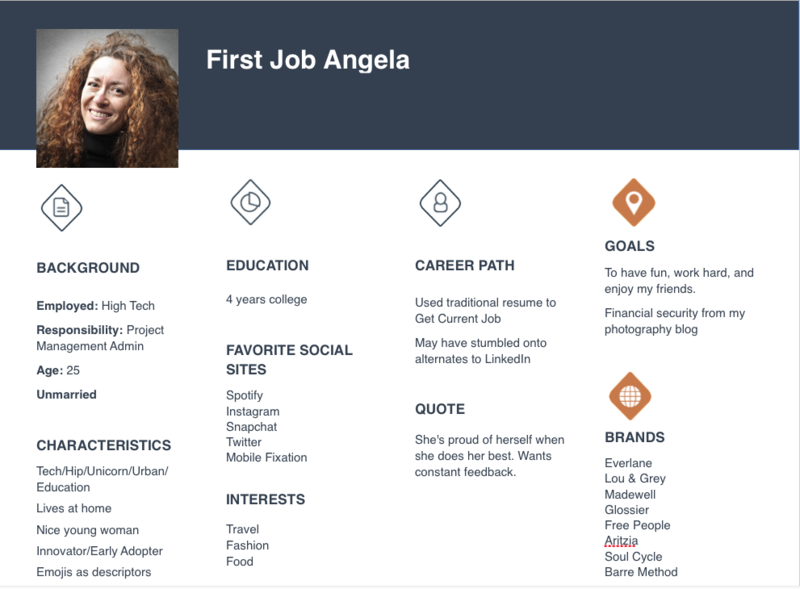 Finally, write up your persona example. Think of it as a biography or resume of the person most likely to be your best customer. Give him/her a name and then fill in the story including their buying habits and their relationship to your business. Once you’re comfortable with Harry, the product manager, and Sally, the CIO, post their profiles where everyone can see them. Sometimes, you’ll get additional comments from the sales force, the IT managers, and even the CEO. Incorporate this information to solidify your Personas and to build consensus. While it takes a lot of work to build Personas, you should revisit your creations regularly to make necessary edits and updates. After all, basing your content and marketing efforts off of stale Personas is almost as unproductive as not having personas at all. Based on the identified wants, needs, pain points, and goals of a given Persona, you can now begin to craft content that provides specific solutions. Craft a blog post or ebook that speaks to these pain points, and watch your conversion rates climb. Understanding the type of language that your Personas use makes it easier to construct appropriate messaging. You may need to get busy rewriting your home page, landing pages, and blog posts, to ensure that you are building trust and communicating value. Let your Personas also guide your search strategy. How do your Personas search for information? If your Personas commonly search using long-tail keywords, make sure your website is optimized for those terms and phrases. Don’t forget to factor in the role of technology in the day-to-day lives of your Personas. Are they glued to their smartphones? Are they likely to research at home using a tablet? If you know their technology preferences, you can respond accordingly, perhaps by optimizing your website for mobile. Use your Persona’s personal information to influence how and when you publish blog posts, how much time to spend on social media, or what day of the week to launch your next email marketing campaign. It’s time to get away from thinking about prospects and customers based on simple demographics that don’t tell even half the story. Instead, you should be building Creative Buyer Personas. It is relatively easy and always fun. The payoff comes when you use these Personas to change your marketing efforts.